If you want great quality brushes, for an amazingly reasonable price then I can really recommend these. As if the fact that Samantha Chapman of Pixiwoo fame fronting the brand wasn’t enough of a recommendation… I can add my 2 pence that these are fab. What makes them special for me is that the feel (and look) luxurious and high-end, but without the high end price point. Plus the style of the brushes I have is that they aren’t the ‘typical’ shape, the single blush brush is tapered, not something you find in lower price brushes I have come across before. The angled foundation brush is narrow, making it easy to get into corners. For the core collection, the foundation and concealer brush are narrow, soft and tapered but the two brushes from this set that really stand out are the smaller sized blusher brush – it’s perfect for adding a bit of contour under the cheek. The larger, domed top powder brush is large but dense enough to buff foundation into skin to finish. The next plus point for the brushes is the case they come in, it has elasticated holders, with spare space for extra brushes to be added. But not only does it work as a carry case, but also as a stand for when in use – so the brushes can be grabbed and used as needed. For me, these really are the ideal brushes. 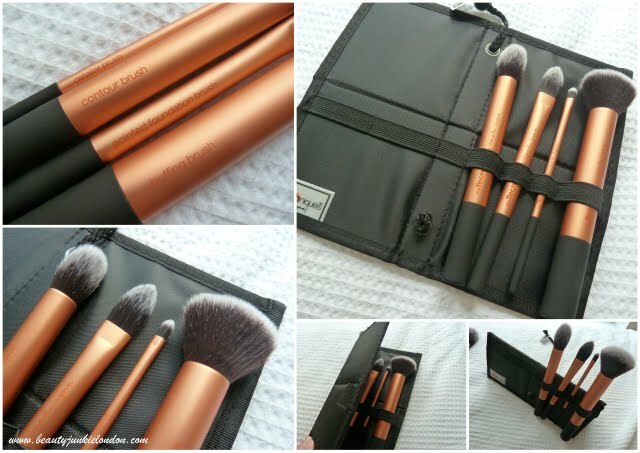 I’m not a make-up expert, so wouldn’t feel happy spending a fortune on a brush set – but these are the ideal balance of excellent value for money and high quality. They really do feel like they should cost more than they do! Available in the UK from Cocktail Cosmetics.